When one thinks of historical military fiction, the mind perhaps turns to the great works of established authors like Michael Shaara, Bernard Cornwell, and C.S.Forester, to name a few. Their works, as a foundation, have literally stacks full of primary source documents and research backing them up. Regrettably, the body of primary source research available to Nick Brown for his book, The Wooden Walls of Thermopylae, is nearly non-existent. It is fair to say that if Brown wanted to find a challenge, he found it with his Luck Bringer series, and especially this, his second book. To the previously mentioned authors, I pledge my untiring respect, my best reading chair, and my finest cognac. Given what he had to work with to complete a similar task, to Nick Brown I loaned this same level of attention as I read The Wooden Walls of Thermopylae. The Athenians have won their battle at Marathon. Now they await the Great King's revenge as he works to assemble a massive army unlike any the world has ever seen. In Athens, a city seething with treachery and intrigue, Mandrocles and his friends live, love and observe - bystanders among politicians and factions fighting for power as the ultimate conflict draws near. 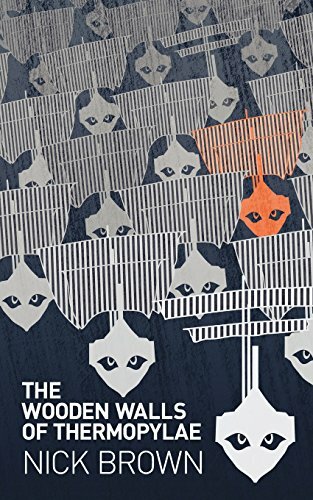 The Wooden Walls follows Mandrocles and the greatest figures of ancient Greece as they come to terms with their threatened civilization and the date with destiny at Thermopylae. Brown does a noble job with this work, which generally parallels The Histories by Herodotus, starting at around Book 7 of that famous work. Indeed, Brown displays his respect to the "Father of History" in the book’s title that is taken from the pivotal part of the book when Themistocles persuades the Athenians to build a fleet of wooden triremes to fight the Persians at sea. What was particularly gratifying was the balance Brown provides to the Athenian perspective, unlike that of Herodotus who writes heavily on the military musings within the Persian strategic camp. While the dialogue feels at times forced, this may be forgiven due to the previously mentioned absence of primary source documents from that time. In his writing, Brown is comfortable introducing major sections of his book using an unforgiving and gritty style that mimics many of the popular scene narrations from the blockbuster movie 300, and its sequel, 300: Rise of an Empire. Consider the opening to Chapter 14: "I’ve seen men cover their heads with their cloaks before the death stroke takes them, as if they thought that if they couldn’t see it then it wasn’t real. Nothing helps: you fight or you die; nowhere to run to at sea." In this passage, Brown makes the reader feel like a seasoned war veteran. Not as sharp are the simple exchanges between Mandrocles and the other characters in the first half of the book, which I found underdeveloped and repetitive – a similar criticism that I would submit for the dialogue in the two previously mentioned movies. Brown uses other styles that leave the reader with a far richer sense of the times. For example, one may also detect the influence of Ernest Hemingway throughout the book as showcased by this example in the opening of chapter 21: "Scents, it’s the scents I remember most clearly from that last spring before the war: piles of fresh cut timber everywhere and caulking to waterproof the hulls, sweat from the mean learning the back breaking art of working an oar all day. The spume of the sea spray thrown up as the new triremes rolled and tossed through the swell." This passage left me reflecting on a similar passage by Ernest Hemingway’s in For Whom the Bell Tolls, when El Sordo describes life just prior to losing his own. However, rather than drawing out that intoxicating description where one could almost smell the damp and salty timbers of the trireme, Brown returns to his gritty style by closing out the paragraph, "But above everything else, hanging over Athens like a pall of storm cloud: the smell of fear". My respect goes to Nick Brown as he endeavors to capture the essence of a band of brothers nearly lost to time. When he succeeds, which he does often, the reader is left with a deep and rich appreciation of Mandrocles and his companions, their lives, and their times. Retired Army Colonel with 27 Years of Service in the U.S. Army with deployments throughout the Middle East and Europe. Currently Directs Programs and Partnerships for Old Dominion University. Brown, Nick. "The Wooden Walls of Thermopylae." Ancient History Encyclopedia. Last modified December 07, 2015. https://www.ancient.eu/review/95/. Brown, Nick. "The Wooden Walls of Thermopylae." Ancient History Encyclopedia. Ancient History Encyclopedia, 07 Dec 2015. Web. 20 Apr 2019.